SAN JOSE, CA – Continuing its long-standing participation in NCAA Division I-A intercollegiate athletics, San José State University has accepted an offer to change its conference affiliation by joining the Mountain West on July 1, 2013. “Joining the Mountain West in 2013 is an exciting opportunity for San José State University’s student-athletes, coaches and our many supporters,” President Mohammad Qayoumi said. “I want to thank everyone who worked hard to make this happen. The Mountain West and San José State are a great match. Beginning in 2013-14, San José State will share Mountain West membership with the Air Force Academy (Colorado Springs, Colo.), Colorado State (Fort Collins, Colo.), Fresno State (Fresno, Calif.), Nevada (Reno, Nev.), UNLV (Las Vegas, Nev.), New Mexico (Albuquerque, N.M.), Utah State (Logan, Utah), Wyoming (Laramie, Wyo.) in many of its sports and Hawaii (Honolulu, Hawaii) in football only. “Today is a historic day for San José State University athletics. We are proud to join the Mountain West in 2013 and continue our long and rich history of offering our student-athletes and coaches the opportunity to compete at the Division I-A level. In addition, our fans and alumni will continue enjoying the best in major college athletics,” said San José State University Interim Athletics Director Marie Tuite. With the recent addition of women’s outdoor track, 14 of San José State’s 17 NCAA Division I programs will compete for Mountain West championships. Presently, the Mountain West does not sponsor conference championships in men’s soccer, women’s gymnastics and women’s water polo. SJSU has a total of 450 student-athletes. The Spartans will be exiting the Western Athletic Conference after securing membership in July 1996. 1890 – San José State plays its first intercollegiate athletics contest in baseball. 1950 – San José State philosophically commits to competing in major college athletics. The football team competes as an independent. Baseball and men’s basketball later join the West Coast Athletic Conference (WCAC). 1969 – San José State is a founding member of the Pacific Coast Athletic Association (PCAA). 1982 – San José State’s women’s athletics teams relinquish AIWA membership to compete as NCAA programs with conference affiliation in the NorPac Conference. 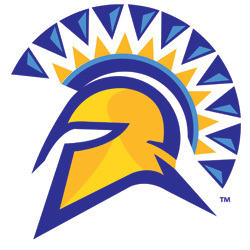 1986 – San José State women’s athletics teams join the PCAA. 1988 – The PCAA changes its name to the Big West Conference. July 1, 1996 – San José State is one of six schools joining the Western Athletic Conference. 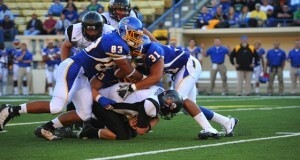 July 1, 2013 – San José State is one of two universities joining the Mountain West. San José State — Silicon Valley’s largest institution of higher learning with 30,000 students and 3,850 employees — is part of the California State University system. SJSU’s 154-acre downtown campus anchors the nation’s 10th largest city.